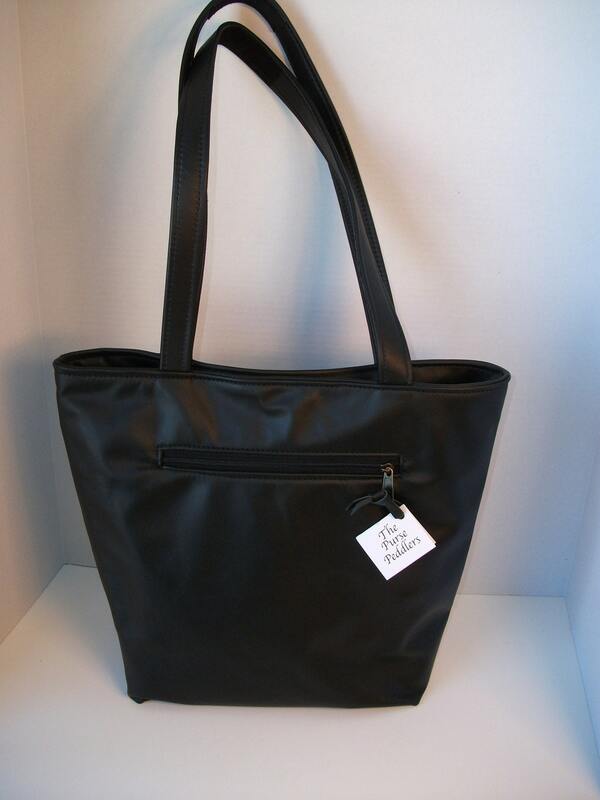 We call it our small tote bag, but most of our customers use it for their everyday purse. It measures app. 13" tall x 15" wide at top, the base or bottom measures app. 11" x 5". It has a magnetic snap closure, outside zipper pocket app. 8" wide x 6" deep. The lining is a very durable cloth with an inside zipper pocket and magnetic key snap on one side with 3 divided pockets sewn to the other side, app. 5" wide x 8" deep. Black, super soft, full grain leather. We can make this in other colors, inquire as to availability. Lining color varies, but we always use a durable cloth lining. Love the different colors....another nice lining and the leather is soft to the touch. Zippers work nice and smooth. Good quality bag with super liner. This purse is as good or better than most. Well worth the price. It is a very nice purse and quite roomy, although the strap could be about 4" longer for better comfort. Love this purse and it was customized to have the longer crossover strap for me. Beautifully made and quality too. Thank you so much!! We accept PayPal and Mastercard,Visa, and Discover. If you are not happy with your purchase please notify us immediately through etsy conversation at thepursepeddlers.etsy.com. The item has been used and/or shows signs of wear or smells (i.e. cigarette smoke, etc. ), becomes lost or damaged when being returned, for example due to inadequate packaging or incorrect address. We recommend that you return the item priority mail, with tracking and insurance, the way we send it. Custom Orders are FINAL SALE, no refunds or exchanges. Packages will be sent to the address given on your ETSY shipping form, NOT your paypal form. All purchases will be shipped within 3-5 business days of purchase.